There are many moments that make up a life – some even life-changing. For Dounia Senawi Lievan, it was when she realized she didn’t exercise at all and wanted to change that. That was all the motivation it took to push her to run her first ultramarathon, about 50 miles. One moment. Lievan, 38, is a Principal at Deloitte Consulting, leading the Customer & Marketing practice for Financial Services. It was one night during dinner with her colleagues, one being an ultrarunner who looked over and asked her what she did to stay healthy. She replied with, “Nothing – I have a lot going on right now.” She says that one moment changed her life. “I think it was the combination of embarrassment and competitiveness – but that’s all it took. I remember thinking, “If he can run a 100 miles so can I,” said Lievan. Before this, she had never run a mile. The next day, she started walking. Walking turned into running, and four months later, she was at the starting line of her first half marathon, with a goal in mind that she would run the entire thing. This is something she will never forget. Livean shares that running has become something that challenges her in many ways, mentally and physicals. “It takes me back to sitting with my grandfather and listening to him tell me that the most important lessons learned come from the goals you work the hardest to achieve,” she said. The ultramarathon was on June 2nd in Northern Michigan. 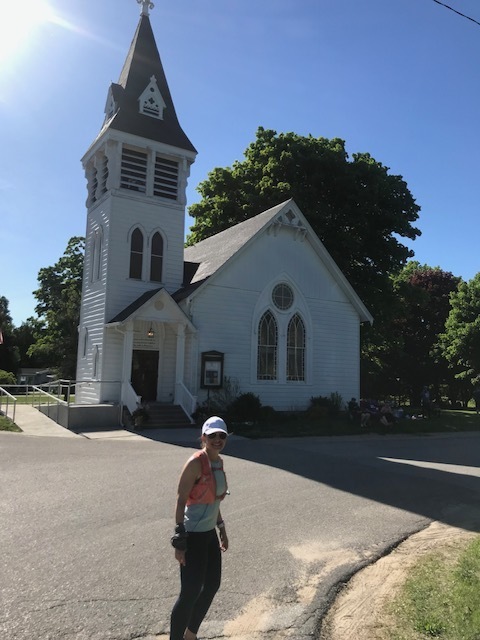 The 50 mile course ran from Torch Lake to the Petoskey Light House. Lievan shared that during the race, you have to have a crew that leap frogs you in a car for the entire day, making sure you drink enough water, eat enough, take your salt pills on time, help you with your blisters, change your socks and shoes, and who also pace you during the evening hours. Lievan’s brother and son John were part of the crew, along with her cousin who traveled from San Diego to pace her. Her colleague was set as their ‘phone an expert. “I couldn’t have done it without them. I didn’t know what to expect but had told them that the only way that I would quit was if I was peeing blood or seriously injured. So they would shout “Cross that Line” or “Dounia – 37” (37 was my bib number) when the race got tough,” Lievan says. While she had a few tough moments during the race, the combination of the afternoon heat, the rolling hills, the pitch black trails in the middle of the night. There were many moments where she stopped to enjoy the ride and the beauty around her when she smiled, knowing she pushed herself and worked hard. Lievan shares she is grateful to her family for supporting her every step of the way, as well as her crew. And life changing it was. After crossing the finish line, she took a few days to rest and was running again just four days later. Lievan is grateful for the opportunity she had to really challenge herself and really learn what she is capable of. “We have much more in our reserves than we think - just have to have the right mind set in the face of what’s coming. I was also glad that my son was a part of it…to witness that anything is possible with hard work…and that you never give up,” she says.